Pleasant 4-bedroom, 2-bath, concrete block/cement slab house. The attached granny (ohana) unit has the 4th bedroom and 2nd full bath. The enormous backyard, huge banyan tree, complete fencing, and corner location give the feeling of seclusion and privacy. Off-street parking for two cars for the main house. The granny unit has its own full bath and kitchenette, with a large, private, brick-paved patio, covered garage, and private street entrance. But the best feature of this property is its location directly across the street from the beach access to the most beautiful white-sand beach on Oahu. 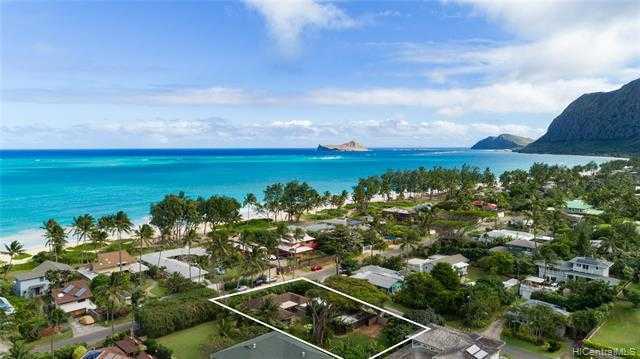 Located in the section of the Beach Lots farthest from Waimanalo Beach Park, it’s a special neighborhood. This is not a location that comes up for sale very often. Fresh new int. + ext. paint, landscaping, and ceiling fans. I would like to schedule a showing appointment for this property: MLS# 201830412 – $1,399,900 – 41-1004 Laumilo Street, Waimanalo, HI 96795.